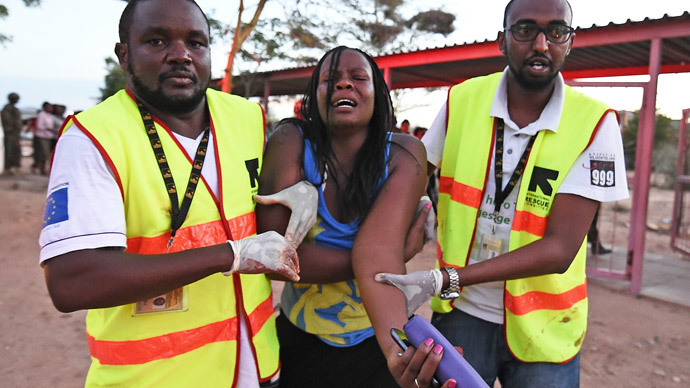 A survivor of the massacre at Garissa University College in Kenya was found on Saturday, two days after Al-Shabaab extremists slaughtered 148 people. Cynthia Cheroitich, 19, had cowered in a wardrobe for two days. The student was finally coaxed from her hiding place in deep shock. She had covered herself with clothes and said she drank a bottle of lotion to stave off hunger and thirst, AP reports. Cheroitich has been taken to hospital where she is currently undergoing treatment, Kenya Red Cross spokeswoman Arnolda Shiundu told AFP. Kenyan troops searched the building for two days after the tragedy and heard sounds coming from a wardrobe. When Cynthia's rescuers urged her to come out, she first suspected them of being militants, and only agreed to emerge after security forces got one of her teachers to talk to her. "I was just praying to my God," Cheroitich, a Christian, told AP of her nightmare ordeal. It's Kenya's deadliest attack since the 1998 bombing of the US embassy in Nairobi, and the bloodiest ever carried out by Al-Shabaab militants. The gunmen stormed the university in northeastern Kenya, near the border with Somalia, at dawn on Thursday as students were sleeping. The terrorists threw grenades and fired automatic rifles, shooting dead dozens. They set Muslims free and held Christians and others hostage. They massacred 148 people, including 142 students, three police officers and three soldiers. Four of Somalia's Al-Qaeda-linked gunmen were also killed on Thursday evening. Al-Shabaab threatened more attacks such as the assault on Garissa University College, according to the SITE intelligence-monitoring group. The Islamic militant group issued a statement saying the latest attack was staged in retaliation for killings carried out by Kenyan troops fighting the rebels in Somalia. "No amount of precaution or safety measures will be able to guarantee your safety, thwart another attack or prevent another bloodbath," the statement warned. "Kenyan cities will run red with blood ... This will be a long, gruesome war of which you, the Kenyan public, are its first casualties," the statement, issued on Shabaab-affiliated websites and Twitter accounts, said. Five men were arrested in Kenya on Saturday in connection with the university massacre. "Three were the coordinators who were arrested while trying to flee to Somalia, two were arrested within the precincts of Garissa University," Interior ministry spokesman Mwenda Njoka told AFP. The names of the three suspected organizers have not been disclosed, but Njoka said the two arrested on campus included a security guard at the university, and a Tanzanian man suspected of helping the gunmen. He was found "in possession of jihadist materials."